Eckhard RAU, Jesus Freund von Zöllnern und Sündern. Eine methodenkritische Untersuchung, Stuttgart : Kohlhammer, 2000. 24 cm. 181 p. ISBN 3-17-016608-5. DM 48,90. Paul BEAUCHAMP, D’une montagne à l’autre. La loi de Dieu, Paris : Seuil, 1999. 21 cm. 255 p. ISBN 2-02-036687-8. FF 130. James M. ROBINSON – Paul HOFFMANN – John S. KLOPPENBORG, The Critical Edition of Q. Synopsis including the Gospels of Matthew and Luke, Mark and Thomas with English, German, and French Translation of Q and Thomas, Leuven/Minneapolis : Peeters/Fortress Press, 2000. 21 cm. CVII-581 p. ISBN 90-429-0926-9/0-8006-3149-8. ¤ 74,20/$60. Giorgio AGAMBEN, Le temps qui reste. Un commentaire de l’Épître aux Romains, traduit de l’italien par J. Revel (Bibliothèque Rivages), Paris : Payot/Rivages, 2000. 20 cm. 271 p. ISBN 2-7436-0686-X. FF 120. Margaret E. THRALL, A Critical and Exegetical Commentary on the Second Epistle to the Corinthians, II : Commentary on II Corinthians VIII-XIII, (ICC), Edinburgh : T&T Clark, 2000. 22 cm. 496 p. ISBN 0-567-08543-0. £ 39,95. Jean-Noël ALETTI, Saint Paul. Épître aux Éphésiens. 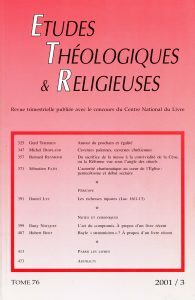 Introduction, traduction et commentaire, (Études bibliques NS 42), Paris : Gabalda, 2001. 24 cm. 351 p. ISBN 2-85021-130-3. FF 280. Matt A. JACKSON-McCABE, Logos & Law in the Letter of James. The Law of Nature, the Law of Moses, & the Law of Freedom, (Supplements to Novum Testamentum 100) Leiden : Brill, 2001. 24 cm. 281 p. ISBN 90-04-11994-9. $ 100. € 81. David G. HORRELL – Christopher M. TUCKETT (éd. ), Christology, Controversy & Community. New Testament Essays in Honour of David R. Catchpole, (Supplements to Novum Testamentum 99) Leiden : Brill, 2000. 24 cm. 404 p. ISBN 90-04-11679-6. $ 120/€ 95. Craig A. EVANS, The Interpretation of Scripture in Early Judaism and Christianity. Studies in Language and Tradition, (JSPS 33), Sheffield : Academic Press, 2000. 24 cm. 488 p. ISBN 1-84127-076-8. £ 55/$ 85. Philippe ABADIE – Jean-Pierre LÉMONON (éd. ), Le judaïsme à l’aube de l’ère chrétienne. XVIIIe congrès de l’ACFEB, (LD 186), Paris : Cerf, 2001. 21 cm. 412 p. ISBN 2-204-06564-1. FF 295. FLAVIUS JOSÈPHE, Les Antiquités Juives, III : Livres VI et VII, Établissement du texte, traduction et notes par Étienne Nodet, Paris : Cerf, 2001. 20 cm. 244 p. ISBN 2-204-06595-1. FF 240.